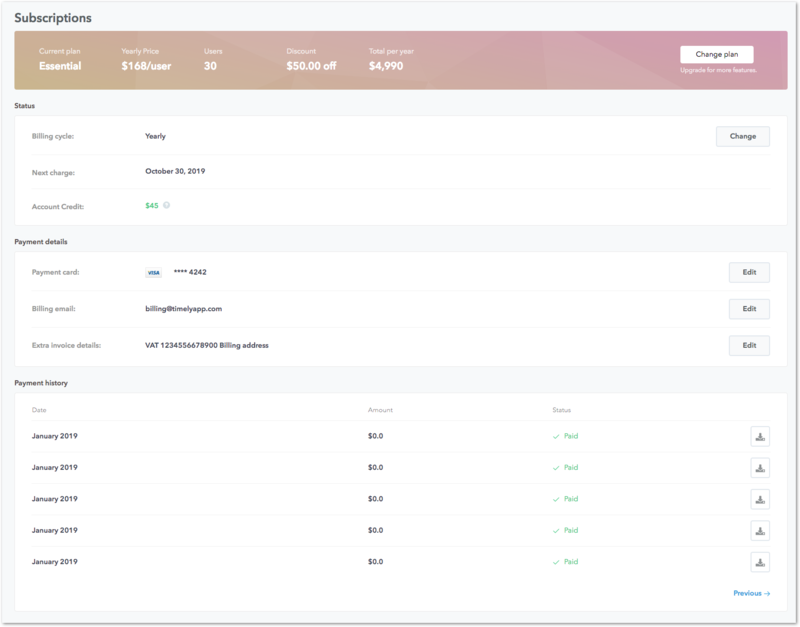 There's a full summary of all subscription-related details, including the total price of your subscription based on the amount of users you've added to your account. How do I switch to another plan or billing cycle? Select the 'Change plan' button at the top of the Subscriptions page. This will bring you to the Plan Selection page. You'll see the total charge, based on the number of users currently on your account. Just select your billing cycle option at the top - Yearly or Monthly - and click the green "Choose plan" button for your preferred plan. To confirm the change, press "Agree and switch". You'll know the request was completed when you are automatically redirected to the main Subscriptions page. You can edit your credit card details in the 'Payment Details' section on the Subscriptions page. Once you've updated your information and hit "Save", your payments will be processed on the new card. I added my credit card details and selected my plan option while 'In Trial'. My trail has ended and I have not yet been charged. If your trial period has ended, your card will be charged within 24 hours. Don't worry; you'll still be able to track time with Timely during that period. If you're setting up payment while still in your trial period, your payment will be processed as soon as your trial ends. I need my Timely invoices to go to my Accounts Payable department. How can I change the billing email on our Timely account? Change the billing email on your Timely account from the 'Payment Details' section on the Subscriptions page. Can I pay yearly instead of monthly? Absolutely! 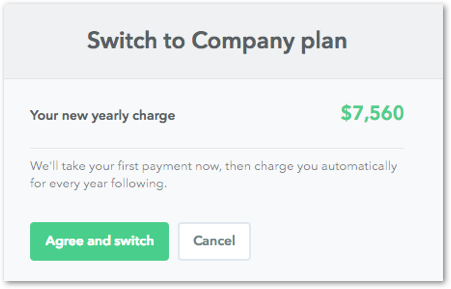 When you're setting up payments inside of Timely, you'll be able to choose between monthly or yearly payments. Select Yearly billing and save 10%! Can I pay via a custom invoice or bank transfer? *For single user accounts, unfortunately we cannot offer custom invoices or bank transfer payments. 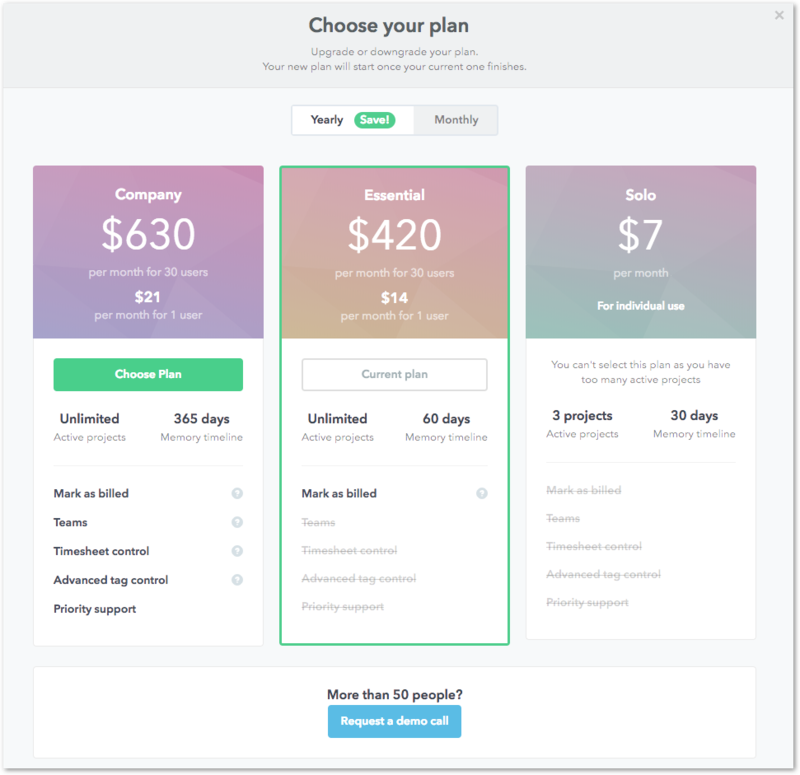 How do features differ between plans? See more about Pricing and Plans. What happens to my subscription once I delete the original account admin? You are not able to delete the owner of the account. If the person in your company who originally signed up with Timely is leaving, the account owner needs to go to Settings > Global on their account to transfer account ownership.